November 2016 - Berlin, Germany: art’otel berlin mitte, a lifestyle hotel fusing the art and vision of the signature artist, German painter and sculptor Georg Baselitz, with outstanding service in the heart of Berlin Mitte, is inviting guests to discover its brand new design, following an extensive renovation which brings Baselitz’s work to life. Whether it’s a relaxing break, a festive trip to one of the city’s 60 Christmas markets, or a visit to one of the many museums, restaurants, bars or clubs, Berlin has so much to offer travellers looking to explore the city this winter. Guests can save up to 20% with art’otel berlin mitte’s early saver offer, whilst being one of the first to discover the newly designed hotel and restaurant, inspired by Baselitz’s unique style of expression. Baselitz is particularly known for his upside-down images, which international design practice, Scott Brownrigg, has subtly interwoven throughout all the design elements of the hotel. The newly opened Upside Down Bar & Restaurant, located in art’otel berlin mitte’s historical Ermelerhaus wing, is dominated by a series of “Upside Down” paintings and works by Baselitz and provides diners with a light and fresh menu of bites and snacks to share drawing on inspiration from across the Mediterranean. In the hotel’s Upside Down Bar, guests can enjoy a number of drinks, such as locally distilled Berlin Adler or Brandstifter Dry Gin, as well as signature cocktails including the Berlin Passion, featuring Rum mixed with sugar syrup, Lime and Passionfruit, as well as the Apple Thyme Twister, a Vodka and apple blend, infused with bitter lemon, Grenadine and Thyme. A diverse events programme featuring a Funky Jazz Brunch, Cocktail master classes, After-Work-Party and a Friday night DJ take place in the bar throughout the year. The hotel’s central location in the trendy district of Mitte is ideal for city-breakers looking to explore Berlin’s famous landmarks. The vibrant Alexanderplatz with its TV Tower, the Red Town Hall and the Berlin Cathedral are all within walking distance, whilst the Reichstag and the iconic Brandenburg Gate are just a short subway ride away. Guest’s looking to experience some of Berlin’s most popular Christmas markets are perfectly located in art’otel berlin mitte, with several located moments away from the hotel. The traditional Alexanderplatz Christmas market brings a festive spirit to the square and includes a pyramid lit up with more than 5,000 lights, whilst the charming Berliner Weihnachtszeit at Red Town Hall features its own ice rink and petting zoo. The Christmas Market at Gendarmenmarkt, centrally located between the French and German Cathedrals, is one of the most atmospheric in the city, providing a large range of handmade goods crafted by artisans, a selection of unusual and tradition Christmas foods, and entertainment from Jugglers and fire-eaters to Gospel choirs. All 109 rooms and suites, as well as the entrance, lobby and reception have received an inspiring new look, featuring new bathrooms, modern beds and bold furnishings, with the design encompassing Georg Baselitz’s use of wood with metallic, Gold and Copper themes. 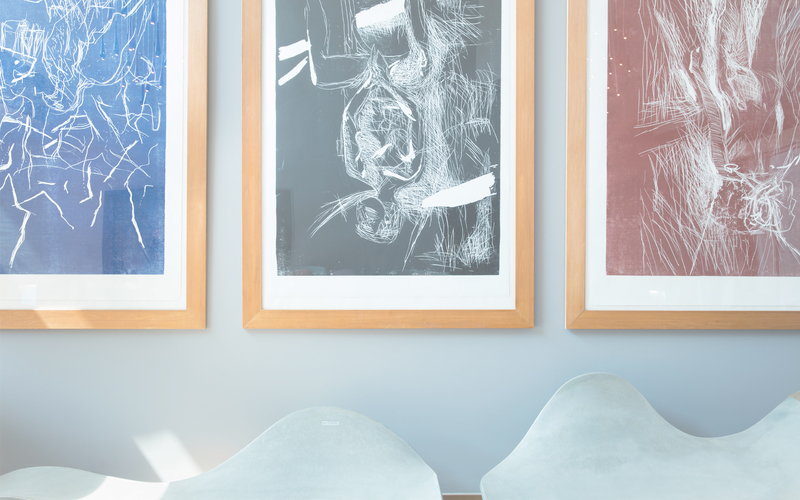 In addition, the grey walls in the public areas, combined with the famous Baselitz paintings provide a striking new feature, whilst the elegant furniture, such as the comfortable armchairs, alongside the seven metre sculptural concrete seat gives the hotel its very own unique touch. Since its original opening in 1997, art'otel berlin mitte has displayed a permanent exhibition with 328 works by Georg Baselitz. From large pictures to smaller charcoal drawings, each room includes a painting, an etching or a graphic of his work. Baselitz focused early on deformations, the power of the subject, and the liveliness of the colours, which has been brought to life within the hotel’s renovation. Lizzy Kelk, Corporate Operations Manager, responsible for the art'otel branding as well as the development and implementation of the brand standards, says: "With the extensive renovation of art'otel berlin mitte, the art’otel brand is continuing to expand its contemporary look, merging architecture style with art-inspired interiors across Europe. The interior design is inspired by art'otel amsterdam which fuses innovative design with thought provoking urban art which art’otel berlin mitte will continue to reflect while dedicated to its signature artist Georg Baselitz throughout. •	Advance booking period varies from 7 - 30 days in advance and qualifies for between 10 - 20% off Best Flexible Rate. •	Advance Saver Rate is for room only and excludes breakfast. •	Advance Saver Bed & Breakfast Rate includes breakfast and children 12 and under eat breakfast for free. •	Minimum payment of 1 night only is pre-payable and non-refundable. Select hotels require full pre-payment. •	Pre-payment element of one night is non-refundable but remaining nights are refundable. •	Penalty applies to all cancellations. •	Rate includes Value Added Tax. •	Rate includes City Tax. © 2019 PPHE Hotel Group Limited. All Rights Reserved.